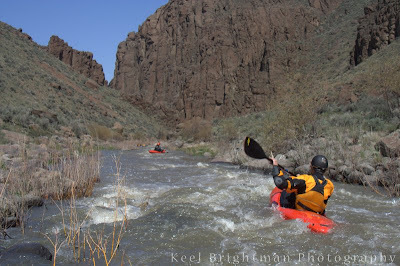 A very unique high dessert canyon run on a small creek that offers a boatable flow at high water. Shuttle: Takes about 20 minutes from take-out and back. Put-In: Top of the canyon about 5 more miles up the road from the take-out, park next to the barbwire fence and hike 5 min. 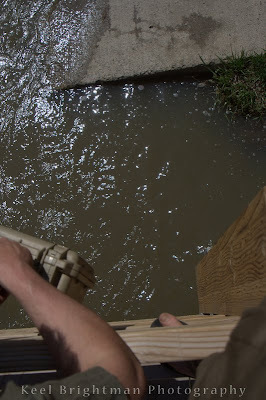 Take-Out: Bridge crossing Succor Creek at Antelope Springs Rd. 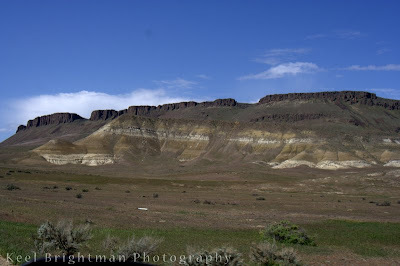 off of Succor Creek Rd. 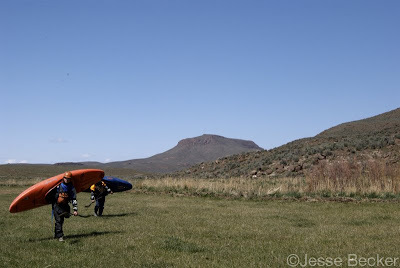 We loaded up and drove up the gravel road, getting a quick view of the creek in one spot and running into a heard of wild horses taking their time to cross the road. We parked beside a barb wire fence and got dressed in the warm weather. We couldn’t see the creek and Jesse asked Mike, “How far are we hiking in, 1 mile or so?” Mike gave a grin and said, “no, It’s right over there. We don’t hike in Idaho!” Good to hear! We crossed the fence and made our way over to the ditch with water in it. The view downstream looked amazing. The walls ross hundreds of feet over head with the classic Eastern OR, western ID scenery. 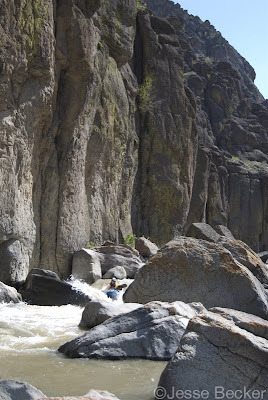 It reminded me of the canyon on the Jarbridge/Bruneau as we approached the walls. and I tried a different approach…. Not pretty, but I made it. 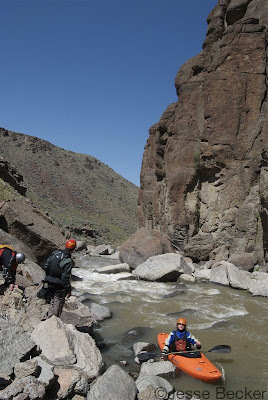 We all laughed about the mank and headed downstream. We came to a pinched off area that Mike called the Italian Pinch. I gave Keel verbal directions after a quick scout and jumped in to follow. 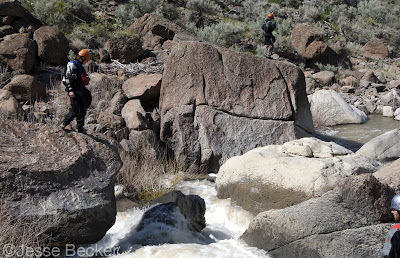 We made it into an eddy on the left above what looked like a nasty drop with a huge rock slab in the landing with water going under and around it. There was one place to possibly run the drop with out getting mangled. 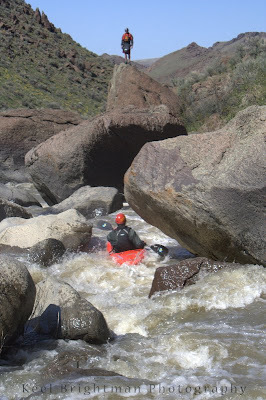 (Keep in mind that we put in on 110 cfs and said line is in one of three seprate channels) We all saw this line, but no one was willing to give it except Keel. He dropped in slow and made the move from left to right, subbed out at the bottom of a 8 foot spout just long enough to make us wonder what was going on and then popped up in the boat width wide channel on the right. We took a break and talked about the line. 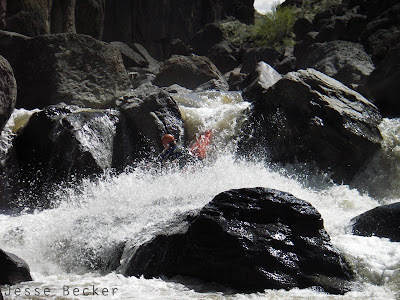 Apparently he was the first to run this drop and we all asked, “What’s the name of it now?” Keel was reluctant to name this rapid being the humble guy that he is, but later in the trip he called it ‘Mojo’. 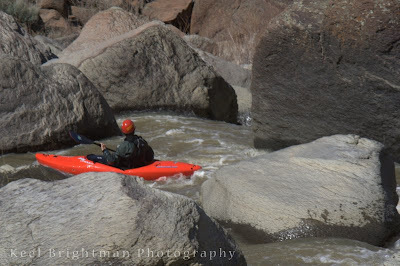 We continued downstream at a slow pace. Many, many, many slots and pinch turns later we came to another steep section. I got out to scout on the left and saw a very tight, long lead in to a bigger horizon line. I ran back up to give verbal directions, but was unsure what was on the downstream side of the horizon. Lost in the read and run I caught an eddy just above it and took awhile scouting this one. 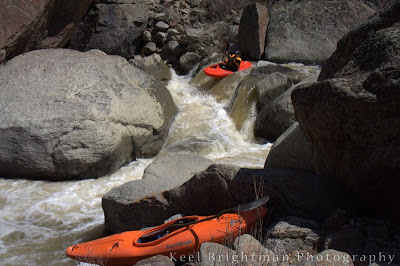 So far the scout and portage options had been great and at the bigger rapids half of the group would scout from one side of the creek and the other half would get out on the other side. Keel & I ended up on creek left and after a long look we decided to walk it. The line on this one was pretty thin and landing on top of a sieve and riding it out did not seem like a fun option. 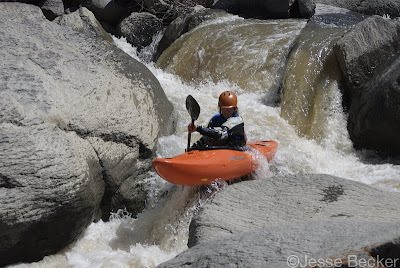 Once the lunch break was over we had a few miles of boogie water and read and run rapids. 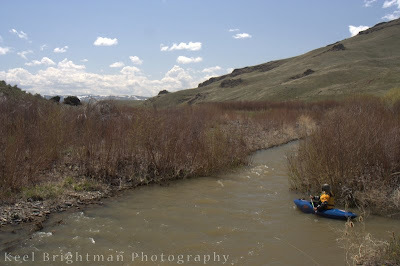 One rapid in particular tighened up and I decide to keep rolling with it, it turned to the left and all of a sudden I came to move that I’ve never had to do before…There was a huge patch of weeds growing in mid creek, no where else to go or stop, boof through the weed patch! I came out the other side laughing as I looked back a saw Jesse have to make the same move….only on Succor I though to myself. We had a series of ledges after this and I was starting to get into the serious read and run stage. 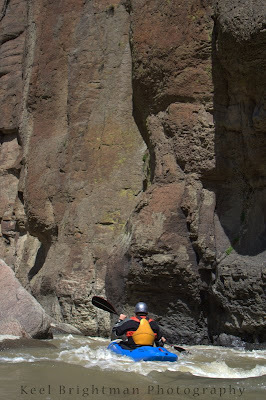 I boat scouted the top and dropped in, they were all pretty straight forward. I later found out that was Triple drop. 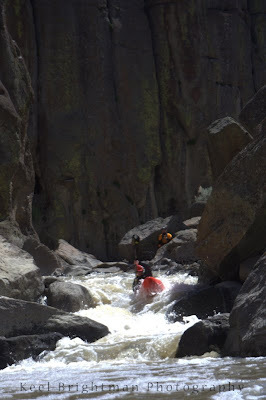 A few miles of mellow whitewater lead us to the final canyon. 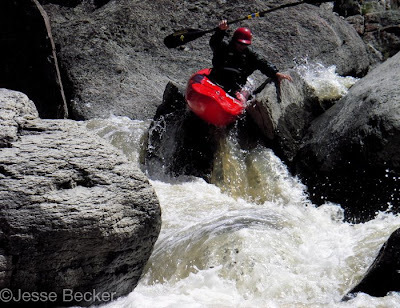 This was a highlight of the trip, no hard whitewater, but unbelivable scenery! Classic high desert canyon with caves in the walls, rock spires rising high over head, and with all the great scenery the take out bridge came sooner than I thought. As soon as you round the final bend and the canyon walls are in the background, your at the take out. 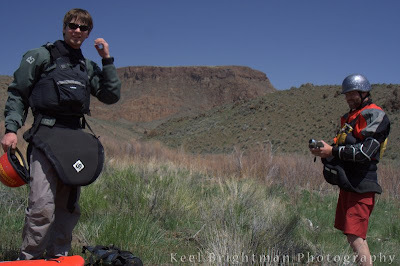 We ended up taking 8 hours geeking out on scenery…we’re not used to the dry desert canyons (big change in scenery from say the LW or Eagle Creek). 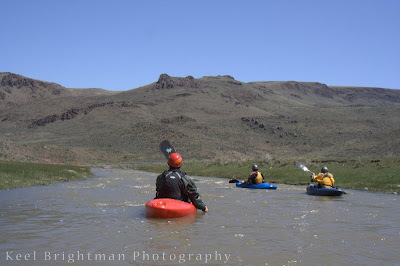 At the take out we were all stoked on our decision with Succor Creek that day and agreed that if we see the gauge at 300cfs, we’re driving back to this corner of the state. We loaded everything up and started our long drive home making it back in the wee hours of the morning.